Some people are immune to the allure of beets. I do not count myself amongst them. I like beets cooked, roasted, raw, pickled, diced, sliced, grated, or whole. I like them in a house, I like them with a mouse. I would eat them in a box, I would eat them with a fox. (Name that Dr. Seuss book!) So yeah … I really like beets! Come winter time in Iran, street vendors sell steaming hot laboo — peeled, boiled beets skewered one on top of another in a cart — given to you wrapped in parchment, hot to the touch, and you eat it just like that, right there on the street. 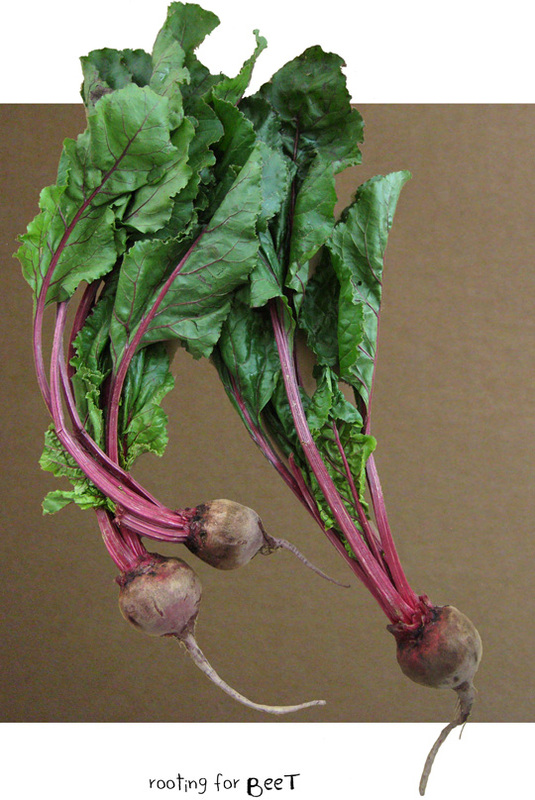 A good beet (is hard to find, boroom boom) has an earthy flavor – which makes sense as it is a root vegetable literally dug out of the earth – and it also has a sweetness plus a subtle acidic flavor that makes for an overall mellow and sophisticated taste. It needs be mentioned that a beet’s green top is edible as well — it tastes like spinach on steroids, leafy but good and nutritious. You can chop it up into a salad; use it with the herbs-mixture of the kookoo sabzi; add it to an āsh as my dear friend Banafsheh likes to do; or use it to make vegetable stock. A cautionary note: consuming beetroot leaves is only a good idea when using organic pesticide free beets. Otherwise, let it go. A second and final cautionary note : beets are colorful. Literally. 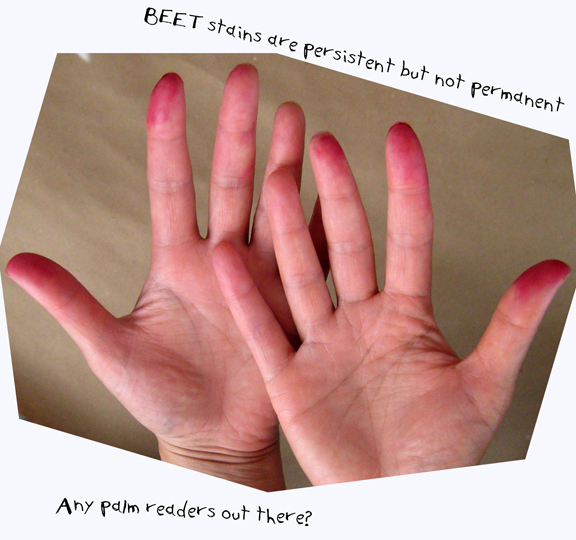 When handling beets, it’s inevitable that you will get your hands and cutting board stained a magenta/red color. Don’t worry though, your hands and cutting boards are safe. The stains do come off after a wash or two (or three.) Just enjoy it as an impermanent body art while it lasts. You won’t need a fortune teller to know that a good laboo va mast makes for a fortunate belly. Wash beets, top and tail, and scrub clean. Chop off the green tops and stalk. 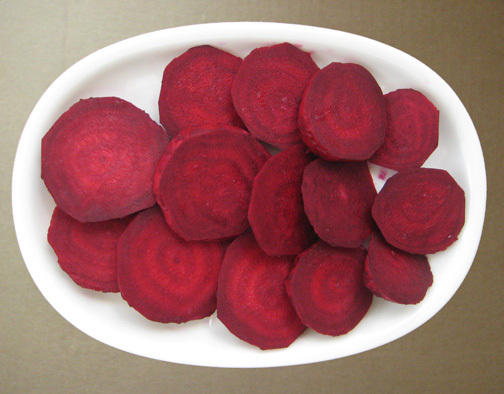 Peel the clean beets and cut into 1/2″ slices. Place beets in a pot and cover with enough water to cover at least an inch over the beets. Add to 2 tablespoons of salt. Bring to a boil and adjust heat so that water continues to boil very gently. Boil beets in this fashion for approximately 15-20 minutes – or until tender enough to pierce with a fork. (Do not overcook.) Drain beets and allow to cool. 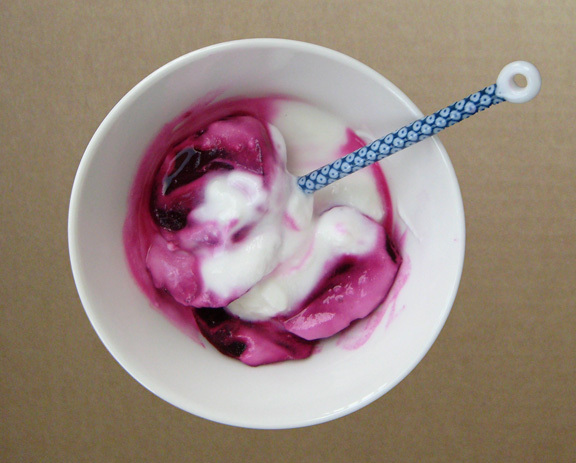 While beets cool off, whip yogurt with a fork to thicken the texture; then divide amongst two serving bowls. Top each bowl of yogurt with 4-6 slices of cooked beets. 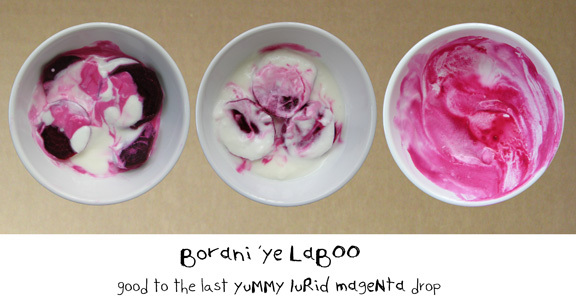 Stir (quite sparingly) with a fork to create a pretty pattern of colorful whirls in the yogurt. (Do not over stir, else the dish will turn into a dramatically lurid purple gloop that deceptively looks like an ice cream parfait than a savory food. Hey, wait … and that’s a problem, why? Garnish with fresh mint springs and/or coarsely chopped walnuts if you wish. Serve as an appetizer, a dip, or a light meal with some type of flat bread. Perfect fare for a hot summer. Beet borani also makes a lovely side dish for rich meat-centric dishes as well. Dig in and nooseh jaan! Great story that your father told you – thanks for sharing it! It’s quaint, right? : ) thank you! I’m not surprised to read you were trying this out for your self – the flavors are a natural combo and you are a gifted and curious tastemaker! I’ve gotta say I like mine san lemon zest (I omitted mention that minor variations of this may add it, or olive oil, and some other stuff, I like it on the plain side) but I’ve also gotta say that it is wonderful with walnuts, just a yummy combo of taste and texture. And mint! Bring on the mint always. Thank you for visiting and for your lovely comment! This yogurt look wonderful. The taste must be wonderful! i LOVE beets (growing up in a persian household!) and that first picture could have been from our kitchen table (minus the adorable spoon. i need one of those). i have so many memories of those red-stained bowls. Beautiful pictures and write up! Hi Ahu! (Your name is awesome by the way!) Thank you for reading and commenting. I’d love to know how you yourself make the laboo mast. Do you add anything to it or do you do it up plain like we do in my family? And ah yes the spoon. I “borrowed” mine from my mom who brought 5 or 6 of them back with her from a trip to Japan. Wish she’d bought a whole box of them. I love beet root halwa. But my husband loves it steamed. Will try your variation when I buy beets next. Your pictures are always amazing- the first one was fantastic! Thank you Radhika. You know when I was reserching the lentil halva I found a recipe for beet root halva as well. Will you make and post yours? That would be really interesting. Would love to see how you make it. I won’t get around to making the recipe for goodness knows how long. YES! can’t wait to read all about it. I feel the same about beets as Sam I Am feels about green eggs and ham! Thank you for this recipe. I have never had them with yogurt before and you better believe I am going to do this. We are kind of sympatico and on the same wavelength so I feel confident predicting you will like it. Tell me if you try it! I love this! And just yesterday, I made a salad from beet greens. Had I known about this then, I wouldn’t have roasted them but turned them into delicious yogurt. Next time! Next time! It’s such a pretty thing to eat as well, it will appeal to you I’m sure. Never had this before, it looks wonderful. I love beets and wear my red fingertips as a badge of honor. It’s so simple and perfect hot weather food. As always a great story and recipe. Red badge of honor! Perfectly put, love that! It’s such a basic dish but at the same time a really nice summer meal. Perfect hot weather food as you say. You know, I love how you made a plate of eaten food look like art! Beautiful post, as always! Not as scary BTW as what Australians traditionally do with beetroot, anyone for a supersaturated malt vinegar hit? I had not heard of Spirited Away but just Googled it and it sounds fantastic. Too bad it’s not on Netflix, gosh darn it. I’ll have to wait to see it. As it happens I was shopping yesterday and the Turkish supermarket had turnips like the ones you used which they had labelled “white radish” (sometimes one sees yellow ones) Daikon are, of course, another breed of radish. They are good in a Korean salad. Lots of goodies in the ME district for Iftar at the moment. As I have beets in the fridge, and buying more yoghurt tomorrow, I’m going to test this out! Will I ever like beets?? Well, not bad! Pan-fried the organic beets sliced in half in oil, then added halved organic garlic cloves and, when they were cooked, added whole cumin seeds and took pan off heat. Served with a dollop of plain yoghurt and this really was a nice combo. Although the cumin seeds need to be freshly ground for it to work. I was running late and hungry so didn’t bother this time around. The beets do still have that slightly musty aftertaste I’m not overly keen on but the cumin worked for me. Might even try this, as a side, with white fish (Pollack), creamy sauce, sweetcorn and fennel seeds. – You may just be changing my mind about beets! Do you buy beets with the greentop chopped off? It’s been my experience that those beets leave/have a weird taste and aftertaste but if you buy it with the greentops, and the beets are nice and fresh, won’t have that problem. My 2 cents! Can’t wait to try this… Looks beautiful!! it’s a very pleasing food to play with and it goes down nice and smooth and just good! Nooshe jaan priya! Veronica! I swear I was thinking of you and tut (which is the new politically correct name for toot) the other day. Yes you did survive toot and if you use this recipe with fresh beets I feel safe saying you’ll like it! Let me know if you go for it. And really happy to hear from you! That makes sense – I think beets are definitely better suited to a more grown up palette. I hope you’ll like this recipe, if anything it has simplicity going for it. Wonder what your own favorite beet recipes are? The spoon is an adored object. I have actual feelings of love for it. It’s crazy but true. I’m always short on beet recipe, so thanks for the inspiration. Will make a nice alternation to a new nordic beetroot pesto I plan to try. Hi Mette! Thank you for reading and commenting. I’m entirely intrigued by your nordic beetroot pesto. I hope you’ll post its recipe. Is it used on meat dishes? Delicious. I love the idea of roasting them in the bakeries’ ovens. What a beautiful post. Thanks for the tips on when to eat the leaves. Thank you! The story made me want to roast them in a hot bakery oven too. This blog has inspired my father to share some stories with me that I don’t think he would have had otherwise as the topic would never have come up. Oh, I’m so looking forward to making this for myself on my next telework day. My husband is one of those odd beings immune to the appeal of beets. More for me! Yes, more for you! : ) Hope you’ll like it and nooseh jaan! This looks delicious! I LOVE your photography too. Beautiful! Laboo Borani and paneer with Nan are two of the reasons I couldn’t stay strictly vegan. I love yogurt (mast) and feta. Steaming laboo from a street vendor makes you forget winter’s plummeting temperatures. When my daughters and I would make the laboo pit stop, we munched and strolled down the main street doing our happy dance. (It involves light kicks to the derrière of the other without tripping on your manteau (long coat). IF, BIG IF, any laboo was leftover, home it would go and be transformed into laboo borani. Oh, what sweet and delicious memories you have conjured. Merci. bah bah, mersi for sharing the lovely story & memories Yvonne joon! What a sweet note about your father. 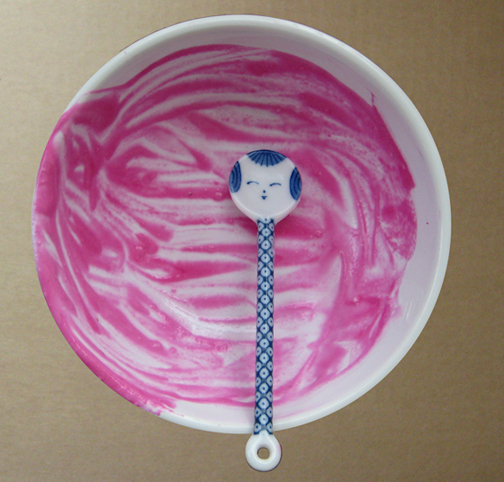 But that spoon is indeed very adorable. Where did you get it? Sharareh joon, it’s a soghati from my folks from their trip to Japan. One of my treasures! Ah Japan, mersi, Azita chanuum. Didn’t imagine that! Thought it would surely be from Iran and already wanted be madaram sefaresh bekonam 🙂 cheyli ziba ast.